Stop by the Conifer Historical Society & Museum between 11:00 to 3:00 today! 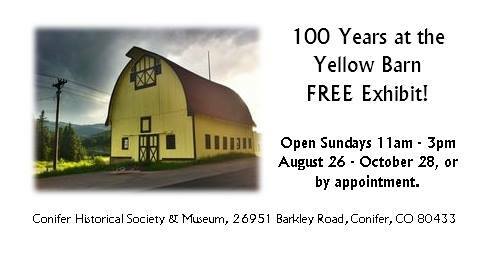 The FREE exhibit featuring the 100th Anniversary of the Yellow Barn and the History of Bradford Junction tells the story of the tenacious pioneers who built and rebuilt at Bradford Junction, the crossroads of two important toll roads in the 1860s. Prohibition violations, indictments, murders, immorality, a replica of the Spotswood Stagecoach and the Yellow Barn blueprints... it’s all here! The Mission of the Conifer Historical Society and Museum is to share the region’s legacy by collecting, preserving and exhibiting historical and cultural materials. Become a member & save on special events!